Interest in creating EPDs has grown dramatically since the most recent versions of Green Globes and the U.S. Green Building Council’s Leadership in Energy and Environmental Design (LEED) program now award credits for buildings incorporating the use of published declarations. Sika, the worldwide market leader in thermoplastic roofing and waterproofing membranes, has published product-specific environmental product declarations (EPD) for its Sarnafil® S327 and G410 single-ply PVC roofing membranes, as well as its Sikaplan® Adhered and Fastened single-ply PVC roofing membranes. The EPDs, which are verified by ASTM International, provide a summary of detailed environmental impact data developed in a life cycle analysis of the products. This information allows architects, contractors and building owners to make better informed decisions when it comes to product purchases. ASTM International is a globally recognized leader in the development and delivery of voluntary consensus standards. EPD specifications are established by a product category rule (PCR), which is created by a committee of interested stakeholders and defines how to conduct a life cycle assessment (LCA) for a product group. Each of the Sika roofing membrane declarations follow Section 11 of ASTM International’s Product Category Rules for Preparing an Environmental Product Declaration for Single-Ply Roofing Membranes from November of 2013. The declared roofing membranes are designed for low slope and steep slope roofing applications. The Sarnafil S327 and Sikaplan Fastened membranes include an internal polyester scrim reinforcement to provide the tear resistance required for mechanically-fastened roof systems, while the Sarnafil G410 and Sikaplan Adhered membranes are reinforced with a fiberglass mat in order to provide the dimensional stability required for adhered roof systems. 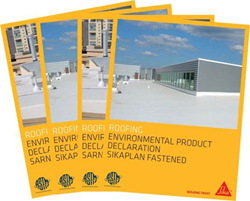 To download the ASTM International verified EPDs for Sika’s Sarnafil S327 and G410 roofing membranes or the Sikaplan Adhered and Fastened roofing membranes, please click here. For more information about ASTM International’s Environmental Product Declarations Program, please click here. Sika AG, located in Baar, Switzerland, is a globally active specialty chemicals company. Sika supplies the building and construction industry as well as manufacturing industries (automotive, bus, truck, rail, solar and wind power plants, façades). Sika’s product lines feature high‐quality concrete admixtures, specialty mortars, sealants and adhesives, damping and reinforcing materials, structural strengthening systems, industrial flooring, as well as roofing and waterproofing systems. Worldwide local presence in 80 countries and more than 16,895 employees link customers directly to Sika and guarantee the success of all partners. Sika generated annual sales of CHF 5.57 billion in 2014. For more information about Sika Corporation in the U.S. including Canton, MA, visit http://usa.sarnafil.sika.com/.